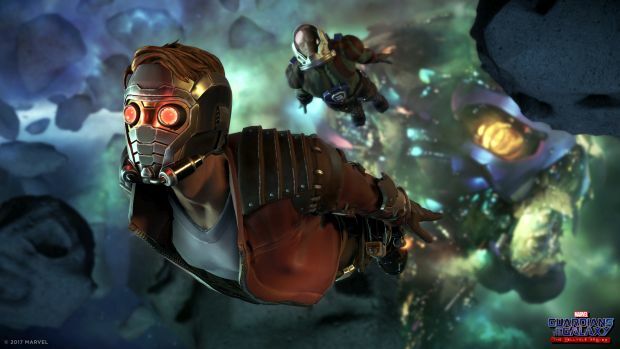 Marvel’s Guardians of the Galaxy: Episode One: Tangled Up in Blue sounds like the sort of game that would be perfect for Telltale Games. While the studio has received acclaim for grim, gritty titles, some of their best games have been lighter in tone such as their Sam and Max adventure games and the hilarious Tales from the Borderlands. However, while Guardians isn’t bad, it’s an awfully slow start for an adaptation of something so fast-paced and fun, and has a huge list of issues that prevent me from recommending the series to anyone based off this episode alone. Guardians of the Galaxy takes a lot from the movie of the same name, which is fitting, considering the fact that most people only know the characters from said movie. However, it’s not set in the same continuity as the film franchise, as it starts off with the death of a very prominent character in the Marvel Cinematic Universe. Like Telltale’s Walking Dead, it seems to more closely follow the comics than the more popular adaptation, with just a few little tweaks to character designs, personalities, and backstories to reference the movies. For example, if you saw the movie, you might be wondering why Drax is going through the same “you killed my family” revenge plot with Thanos after just going through the same one with Ronan, or why Star-Lord has a brand new origin story. That said, there are a lot of differences between the game and the comics as well: the Kree, a technologically advanced alien race that have faced off against the forces of good many a time in the marvel universe, have been wiped out with no real explanation, and this game’s version of Gamora is basically a completely different character in terms of personality, backstory, and appearance. The new puzzle mechanics don’t do much in this episode, but I’m looking forward to seeing them in the next episode. Continuity issues aside, Episode one of Guardians has a really strong start. After a fun, fast paced opening that introduces all of the principle characters and lays out the plot of the episode, you’re quickly thrown into the first puzzle of the game, which shows off two new mechanics: Star-Lord’s hover boots, and a device called a “time scanner”. While the boots just serve as a way to navigate larger rooms, your time scanner allows you to see events that have previously happened, letting you piece information together. While it only gets one real use, it’s still a neat little idea that I hope shows up more in the series. There’s also a radio you can use to talk to the other guardians, which keeps the focus on the characters and gives you something to do while you navigate the (surprisingly large) environments. After that, you’re thrown into an epic fight with a combat system that’s probably the best one Telltale’s put together since The Wolf Among Us. It takes a while to get used to, as it switches between all five of the guardians, but it’s a lot of fun. Despite still being mostly just quicktime events, each character feels like they have their own style. It’s also a pretty lengthy sequence, and while there’s another battle later in the episode, it doesn’t come anywhere near the size and scale of the first. The epic fight scene is also against Thanos, one of the biggest baddies in the Marvel Universe, which just makes it even better. Early on, I was pretty sure I was going to walk away from Marvel’s Guardians of the Galaxy with a positive review, but sadly, the rest of the game past that initial thirty minutes is pretty disappointing. Instead of the excitement and one-liners you’d expect from a Guardians game, you end up with a watered down version. For example, any time you’re given the opportunity to spout off witty retorts to your crew members, they don’t take it in stride or respond in kind. Instead, they seem to take genuine offense, and will bring up any perceived slight later. While this behaviour is understandable in a straight man like Drax, whose inability to understand metaphors and jokes is a noted part of his characterization, there’s no reason that someone like Rocket Raccoon should have such a thin skin other than to create needless drama within the team. The main selling point of all Telltale games is the choices you’re allowed to make and how they shape the story, but these are some of the weakest ones I’ve seen yet. A lot of them either have such an obvious right answer, like whether or not to make a promise to Star-Lord’s dying mother in a flashback, have no real weight due to the player already knowing the outcome, or have no effect whatsoever on the story or pacing. While Telltale games get called out by many for offering the illusion of choice rather than the real thing, this is probably the closest they’ve come in a while to a game that offers no choice. There was only one time that I could definitely tell a choice I made had an effect on the following scene, and even then the change felt like a largely cosmetic one at best. While the characters all look fine on their own, as a group they don’t quite fit. Another gripe I have is that the character models are a mixed bag, to the point where some of them feel like they belong in different games. Drax, for example, looks stylized and buff, like his model from Disney Infinity, as does Groot, but Star-Lord and Gamora are fairly realistic. It’s not just aliens that suffer from this, though; the Nova corp officers you run into are really ugly and don’t seem to fit with the rest of the human characters. There’s not a whole lot of consistency in the game’s art style, which is weird when you remember that consistency in visuals is one of the Marvel Cinematic Universe’s greatest strengths. It’s also pretty glitchy, to the point where I’d be willing to bet this episode was rushed out before all of the bugs could be ironed out to coincide with the release of the new movie. There are a few scenes with missing animations, where Star-Lord’s voice would play while he stood expressionless. But the main problem I had was with the sound design. There are a lot of awkward pauses and moments of radio silence where characters just stand around for a second. This sort of stilted speech absolutely kills any attempt at comedic timing, and as a result, I don’t think I laughed once in the entire game. I don’t really know if this is a glitch or just an issue with the way voices were recorded for the episode, but it feels stilted and off, and it robbed the guardians of their famous charm and charisma. Marvel’s Guardians of the Galaxy feels like a mixed bag. While there’s the promise of a fun adventure in the Marvel universe with a likable group of characters, it’s hampered by the same problems of nearly every Telltale game in the last few years, plus a few new ones. It’s not terrible, but I’d wait to see what the other episodes look like before picking it up.